SpaceUp in Skoltech: A day to remember! This year’s SpaceUp Skoltech, which took place on 21th of April, was a great success! The event was attended by more than 100 participants of all age. The main topic of the SpaceUp unconference in Skoltech was “Limitations of current Space Development”. The discussion focused on different aspects of the issue such as manned missions, technology, business and policies, including the challenges in the path of advancement. Among invited guests were international astronauts. French astronaut Jean-Jacques Favier talked about his mission STS-78. First Swiss astronaut Claude Nicollier gave the presentation on his space experiences of 4 shuttle missions, he also talked about servicing the Hubble Space Telescope in space. Russian cosmonaut Sergei Revin gave a speech about the limitations in academics that were hurdles in the path of space exploration. At the end of the event participants watched the historical space drama “Salyut 7” based on the real events (the Soyuz T-13 mission in 1985). Team SpaceUp Skoltech thanks everyone who was involved! See you next time! SpaceUp is coming to Russia – again! 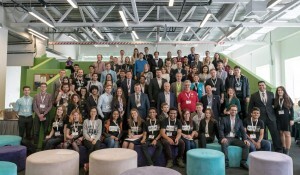 After the success of the first SpaceUp event in Russia last year, Skoltech (The Skolkovo Institute of Science and Technology, which is situated in Skolkovo, suburb of Moscow, Russia) has geared up for the second edition. This year SpaceUp Skoltech will bring in a new dimension that echoes the Skoltech spirit. The team invites and encourages you to share your disruptive ideas which can be transformed into viable space projects or profitable startups! Bring your robots, spacecrafts and any prototype you wish to demonstrate. There will be lunch, snacks and games too! Registration is opened, join us in Skolkovo for another SpaceUp unconference in Russia on April 21, 2018. Hesitate no more: go to the SpaceUp Skoltech, 2018 website to register now! New participants, famous guests, and hot Space topics are waiting for you. See you there!